HANOVER, N.H. (AP) — Just in time for Halloween, a rare "corpse flower" that gets its nickname from its putrid smell is expected to bloom next week at Dartmouth College's greenhouse. Named Morphy, the titan arum is native to Sumatra's equatorial rainforests and has a long, pointy stalk with a skirt-like covering and tiny yellow flowers at its base. It blooms just for several days. When it does, it has an odor described as rotting flesh, a decaying animal or even soiled baby diapers. The plant is decorated with bats, spiders and an arm reaching out of the soil, holding a sign that says, "Help me!" It's been growing several inches a day. By Friday morning, it reached 71.5 inches (1.82 meters). Visitors can go to the greenhouse or see the plant on Dartmouth's webcam . The 15-year-old lime green and burgundy plant last bloomed in 2016, and before that, in 2011. Last time, it reached a height of 7 feet, 6 inches (1.98 meters). "The older a corpse plant gets, the more likely it's going to flower more often," greenhouse manager Kim DeLong said. Morphy's getting bigger, too. DeLong said after the last bloom, the plant grew a large leaf that reached 10 feet (3 meters), nearly touching the greenhouse ceiling. The leaf stayed open for 13 months and was busy photosynthesizing and storing up energy. Once the leaf died in June, greenhouse staff repotted Morphy's swollen underground tuber, which weighed 80 to 90 pounds (36 to 41 kilograms). In 2016, it was only about 30 pounds (14.6 kilograms). Check out our Mid Fall Floral Collection that has just gone live, we have an assortment of seasonal floral for the arrangements. The one everyone seems to be in love with a the shop and social media is Saffron. Vibrant, spicy shades or oranges, peaches and silvery greens create a lush, foraged fall style. Bright pink hydrangeas are nestled with amaryllis, cymbidium orchids, anthirium and roses - popping against olive, eucalyptus, dogwood and magnolia greens. While every detail of Princess Eugenie and Jack Brooksbank’s wedding ceremony was broadcast to 3 million people in the United Kingdom, their wedding reception was private, for family and friends only. Just the most basic details (like the evening party location, the Royal Lodge) were made public. But Prince Andrew just gave more people a glimpse inside the über-exclusive party. He shared a slideshow of the ornate flower arrangements on Instagram. The florals were created by Simon Lycett and Paul Thomas Flowers, using fall foliage and eco-friendly materials from Windsor Great Park. Prince Harry and Meghan Markle also used local flora from the park for their May 2018 nuptials. “The flower arrangements displayed during the wedding reception for Princess Eugenie and Jack Brooksbank last Friday at Windsor Castle were created using autumnal foliage from Windsor Great Park and biodegradable oasis, following the couple’s autumnal theme and eco-friendly request,” Andrew wrote on Instagram. One photo shows a vase of autumn roses from flower breeder David Austin, mixed with berries and colorful leaves. The next shot: a cascading arrangement of blooms and greenery, emerging from a pillar in a grand hall. But perhaps the most stunning photo of all is one of a staircase surrounded by indoor trees, which gave the night an “enchanted forest” feel. Their flowers at St. George’s Chapel also embraced the season. Created by floral designer Rob Van Helden, the arrangements included roses, spray roses, hydrangeas, dahlias, berries, as well as limber trees. Earlier this week, Buckingham Palace also released a photo of the couple’s red velvet and chocolate cake. The five-tier creation took more than 400 eggs to make. Breathtaking Flower Dress How Too! This breathtaking flower dress will not only surprise your customers but also yourself! This beauty will attracts everyone’s attention. People will look twice and stop to make pictures. Guaranteed! The combination of the greens with the Lily, Hydrangea, Eryngium and Clematis is wonderful. Watch the video below to see how this breathtaking flower dress is made and be inspired! Wrap the chicken wire around the mannequin. Start with the Phoenix Roebelini to make the lower part of the dress. Push the stems trough the chicken wire and secure with iron wire if needed. Now add the Ruscus at the lower back of the dress. Use the Leucothoe to fill up the rest of the lower back and work your way up the spine towards the neck. Now use the Eucalyptus to create the base of the chest. Fill in the gaps on the chest with the Eryngium, Clematis and Hydrangea. Your breathtaking flower dress is now ready for use. Enjoy! Snapdragons are charming tall plants, and flower in a range of bright colors. In Spain, where snapdragons grow wild, these flower colors show a remarkable pattern: When driving up a road from Barcelona to the Pyrenees, snapdragons of the species Antirrhinum majus bloom in magenta at the beginning of the road, before a population of yellow flowering snapdragons takes over -- separated by just a two kilometer long stretch in which flower colors mix. Such hybrid zones of snapdragons are quite infrequent; only a few others are known. But why don't the snapdragons mix, with yellow and magenta flowers growing together over a wide area? Nick Barton at the Institute of Science and Technology Austria (IST Austria), together with David Field, previously postdoc in Barton's group and now Assistant Professor at the University of Vienna, collaborated with molecular geneticists at the John Innes Center in Norwich to investigate the causes of this pattern. Writing in today's edition of PNAS, the scientists report that they identified the genes responsible for flower color difference from DNA sequence data. "DNA sequencing is becoming cheaper and cheaper. But analyzing sequence data and interpreting the patterns seen is very hard," Nick Barton explains, "In this study, we used sequence data from Antirrhinum plants to locate the individual genes which are responsible for the difference in flower color across the hybrid zone." The researchers compared the genome sequence of 50 snapdragons of each color, and measured how much the sequences diverged between magenta and yellow snapdragon populations. By plotting a statistical measure of divergence between the two populations, they found "islands" in the genome which are more divergent between yellow and magenta snapdragons than the rest of the genome. In the snapdragons, these islands correspond to genes responsible for flower color. The recent paper focuses on two of those genes, which determine the magenta pigment, and are located close together on the genome. How the sharp difference between yellow and magenta populations is maintained was the subject of the PhD thesis by Tom Ellis in Nick Barton's lab. Through observations both in the field and in experiments at IST Austria, he found that bees prefer to pollinate the most common color flowers in a population: in magenta populations, bees mostly pollinate magenta flowers, in yellow populations, bees mostly pollinate yellow flowers. This selection in favour of the commonest type keeps the hybrid zone sharp, and prevents exchange of genes that are linked to the flower color genes. In the current study, the researchers wanted to know how the two snapdragon populations become different. They found two reasons why the snapdragon populations diverge at the flower color genes. Firstly, selection has favoured new variants at the color genes that make the flowers more attractive to bees -- causing these genes to sweep through the population, and leaving a sharp signal in the DNA sequences. Secondly, the flower genes become barriers to gene exchange. Any genes located close to or even between the flower genes cannot easily be swapped between the populations, and so the region of genome around the genes that determine flower color become divergent. "Even with abundant DNA sequence data, it is often difficult to find exactly why species are different. Our study is the culmination of years of work, combining fieldwork and population genetics with genetic crosses, and analysis of gene expression," explains Nick Barton. Kenya's Flower Market Seeing A Big Boost From China. Red Lands Roses in Kenya produces some of the boldest shades of roses, from a glossy red to a bright yellow and even a vivid pink. Every single bundle of flowers is carefully prepared for export to several countries, with China being one of their biggest markets. This flower farm is just one of many in Kenya, which is the fourth largest exporter of cut flowers in the world. In fact, Kenya's floriculture industry earned more than $800 million in 2017. "On a daily basis we export 36,000 tons from this country," said Clement Tulezi, the CEO of Kenya Flower Council. 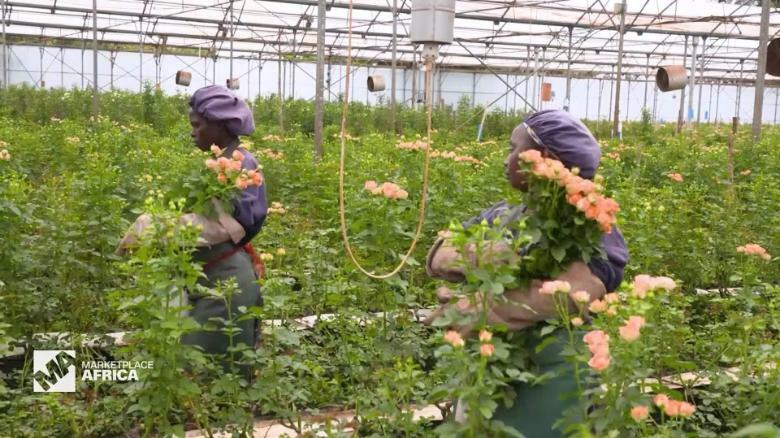 "So we are moving into a place where we want to market ourselves better, we want to brand ourselves better as a country, and also brand the Kenyan flower." And now, Kenya's fragrant beauties are finding their way to farther shores. "We are doing Beijing, we are doing Shanghai, and we are doing Guangzhou," said Irene Nkatha, the sales manager of Red Lands Roses. "We started with one shipment per week, now we are doing two to three shipments per week. The distance is short. It's only one day to go to Guangzhou, it's only two days to go to Beijing." One of the main companies Red Lands Roses exports to is Jiuye Supply Chain in Guangzhou. "We chose to introduce flowers from Kenya to China because of the vast number of varieties they grow, including some that you can't find in other regions," said Qi Bo, the director of Jiuye Supply Chain's flower department. The length of Kenya's flower vase life is also an attractive quality for many. Red Lands Roses - potential to export 30 percent to China. "When you export like a stem today, it will take 14 days to 21 days in vase," Nkatha said. Qi Bo said there is a 25 percent yearly increase in demand for flowers from Kenya in China, and the company expects to double its imports to five million in 2018. "In 2017, we imported 2.5 million flowers from Kenya," he added. "Kenya has advanced breeding and planting skills as well as the cool-chain storage and transport technologies, which China is lacking. The flower industry in China started late, and the overall product quality and its criteria is not mature, especially in terms of transportation. It's very far behind Kenya's." Red Lands Roses said it is exporting 11 percent of its production to China and has the potential to do approximately 30 percent if they were not facing obstacles. "The biggest challenge is the flight," Nkatha said. "We find we have only Kenya Airways, which is going only to one Guangzhou. So if you have another shipping going to Beijing, going to Shanghai, they need to use a domestic, which makes it not convenient and a bit expensive." High tariffs also pose an issue for both sides. "We have heavy taxes and dues when importing agricultural products," Qi Bo said. "To solve this problem, we use a strategy called single import and centralized distribution. That means we import multiple batches of products at a single time and distribute them to Jiuye's warehouses around the nation to reduce the influence of taxes and dues." "Our product is being charged higher taxes in China which makes us not competitive in that market," Tulezi said. "Our hope is that the government will come in so that we can be able to negotiate favorable trade protocols and agreements with China." Fall creates a second season of planting for spring blooming bulbs. Planting in the fall allows a jump start to spring growth. The cool weather helps to make a more enjoyable experience for working outside in the garden and requires less watering. The cooler weather allows spring blooming bulbs to winter over, this is important in order for bulbs to provide beautiful spring cheerful blooms. When bulbs arrive. Bulbs should be planted as soon as the ground is cool, when evening temperatures average between 40° to 50 deg; F. You should plant at least 6-8 weeks before the ground freezes. This is most common in cold climates (zones 1-7). You can, if necessary, store bulbs for a month or longer, if you keep them in a cool dry place. Planting fall bulbs in warm climates (zones 8-11) such as Tulips, Daffodils, Crocus, Hyacinths, Grape Hyacinths, Scilla, and Snowdrops, require pre-chilling in order to bloom. To pre-chill, leave bulbs in their bags and place in a refrigerator for 6-10 weeks. Be careful not to store bulbs near fruit, especially apples, all ripening fruit give off ethylene gas. Ethylene gas can damage and or kill the flower inside the bulb. Once bulbs are chilled plant them at the coolest time of the year. Most importantly bulbs won't last till next season, so make sure to plant them. Read the label. Try to keep the label together with the bulbs until planting. Without the label, you can't tell the red tulips from the white ones just by looking at the bulbs. Where to plant. You can plant bulbs just about anywhere in your garden as long as the soil drains well. The Dutch say, "bulbs don't like wet feet." So, avoid areas where water collects, such as the bottom of hills. Bulbs like sun and in many areas the spring garden can be very sunny, since the leaves on the trees are not out yet. So keep in mind when planting in the fall that you can plant in many places for spring blooms. Step 1: Loosen soil in the planting bed to a depth of at least 8”. Remove any weeds, rocks or other debris. You can mix in compost, other organic matter or slow releasing fertilizer if your soil lacks nutrients. Step 2: Depending on the bulb, follow the recommendation on the label for planting depth. As a general rule, plant big bulbs about 8" deep and small bulbs about 5" deep. Set the bulb in the hole pointy side up or the roots down. It's easy to spot the pointy end of a tulip; tougher with a crocus. If you can't figure out the top from the bottom, plant the bulb on its side, in most cases, even if you don't get it right, the flower bulb will still find its way topside. The Scent Of A Flower. Would a fresh bouquet of flowers lose its appeal if it didn’t smell? Or what if you could no longer buy your favorite perfume? Find out why scientists are studying how pollution is interfering with flowers’ scents. “I've always loved plants. I love flowers in particular; I love smelling them. I'm also really interested in chemistry. I actually majored in chemistry as an undergrad, and also perfumery. The research that I do, it's a perfect mix of all these topics of interest for me. I'm investigating in particular is how pollution affects the ability of floral scent to be transmitted through air,” said Jeremy Chan at the University of Washington. And being able to actually “smell the roses” is a big part of any flower’s allure. But how does pollution affect a flower’s scent? “Let's say you were standing a few hundred meters downwind of the flowers. Are you able to smell the flower? And it turns out that where the chemical compounds that are in the atmosphere affect the ability of floral scent to travel distances,” said Chan. And if pollinators like bees, butterflies and moths can’t pick up a flower’s scent, then these insects can’t do their job. To help them, first, scientists need to measure how far a flower’s scent can travel. “It is really hard because, you might imagine, these scent compounds are present in the atmosphere at tiny concentrations; the atmosphere is mostly air, and even so, you don't feel much when you move your hand through the atmosphere. The best machines that we have can really detect these floral scents maybe a few meters away from the flower, but we know from observations that pollinators can detect floral scents from up to a kilometer away,” said Chan. One example that Chan studies is the hummingbird moth. “I measured the electrical responses of the insect antennae to floral scent, which is a measure of what they're detecting. And I found that the responses were actually much higher to the oxidized gases than to the floral scent itself. That was kind of confusing,” said Chan. Unfortunately, the moth was “smelling” all the scents in the air including the flowers and pollution. “For the pollinators, it represents a lot of noise. It's like trying to listen to a conversation with another person, in a room full of other people that are yelling at each other,” said Chan. The next step for Chan and his colleagues is to measure how far floral scents can travel when the concentration of gases, like ozone, change inside a large, closed room. “Then we can release pollinators, in this case the large hummingbird moth, to observe the scent-tracking behavior in the room, and how it's impacted when we change the levels of these atmospheric gases,” concluded Chan. Chan hopes to study pollution and pollinators to keep floral fragrances in the air, flower bouquets and your perfume bottle. Peach perfection pops against buttery creams, crisp whites and fresh greens. Silvery ferns and bright ascelpias are the perfect bedding for pincushion protea, mokara orchids, creme de la creme roses, mango calla lilies and crocosmia, in a rounded glass vase.